Nelson Rigor was born on 15 April 1863 at Rising Sun, Ohio, Indiana. He was the son of George Washington Rigor and Martha Ann Blackburn. Nelson Rigor died on 30 April 1899 at age 36. [S186] Illinois, Illinois Statewide Marriage Index, vol A-1/ page 0202 license 00001824. Jacob Blackburn married Jane Rawlings. Jacob Blackburn was born circa 1799 at Kentucky. He died after August 1870. [S249] U.S. Federal Census 1850 U.S. Federal Census, by Ancestry.com, Year: 1850; Census Place: Rising Sun, Ohio, Indiana; Roll: M432_163; Page: 311B; Image: 43. [S248] U.S. Federal Census 1860 U.S. Federal Census, by Ancestry.com, Year: 1860; Census Place: Randolph, Ohio, Indiana; Roll: M653_285; Page: 451; Image: 455; Family History Library Film: 803285. [S247] U.S. Federal Census 1870 U.S. Federal Census, by Ancestry.com, Year: 1870; Census Place: Township 9 Range 10, Gallatin, Illinois; Roll: M593_224; Page: 455A; Image: 251; Family History Library Film: 545723. Married Name Her married name was Blackburn. Jane Rawlings married Jacob Blackburn. Jane Rawlings was born in 1802 at Kentucky. She died after August 1870. Married Name Her married name was Sherrard. Katie Catherine Ferguson married Samuel Blackburn Sherrard, son of David William Sherrard and Myra Rigor. Katie Catherine Ferguson was born circa 1879. 1930 Benton, Missouri Katie Catherine Ferguson was listed as wife in Samuel Blackburn Sherrard's household on the 1930 Census at Benton, Missouri. Name Variation Nenretta Goldie Sherrard was also known as Henryetta. Name Variation Nenretta Goldie Sherrard was also known as Goldie L.
Nenretta Goldie Sherrard was born circa 1916. She was the daughter of Samuel Blackburn Sherrard and Katie Catherine Ferguson. 1930 Benton, Missouri Nenretta Goldie Sherrard was listed as a daughter in Samuel Blackburn Sherrard's household on the 1930 Census at Benton, Missouri. Name Variation Eleanor Louise Sherrard was also known as Louise. Eleanor Louise Sherrard was born circa 1914. 1930 Benton, Missouri Eleanor Louise Sherrard was listed as a daughter in Samuel Blackburn Sherrard's household on the 1930 Census at Benton, Missouri. Name Variation Ferguson Sherrard was also known as Bud. Ferguson Sherrard was born circa 1918. He was the son of Samuel Blackburn Sherrard and Katie Catherine Ferguson. 1930 Benton, Missouri Ferguson Sherrard was listed as a son in Samuel Blackburn Sherrard's household on the 1930 Census at Benton, Missouri. Joseph Sherrard married Nancy Sowers. Nancy Sowers married Joseph Sherrard. Name Variation Mattie V. Schooley was also known as Mitty. Name Variation Mattie V. Schooley was also known as Mittie. Mattie V. Schooley was born in September 1870 at Illinois. She was the daughter of William S. Schooley and Sarah B. Kincaid. 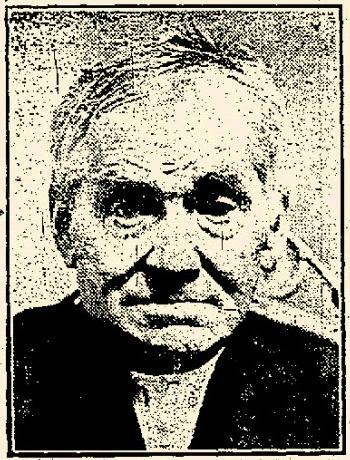 Mattie V. Schooley died after April 1930. Mattie V. Schooley had 2 with 2 living in 1900 children. She had 2 with 2 living in 1910 children. [S186] Illinois, Illinois Statewide Marriage Index, vol 001/ page 0184 license 00002576. [S246] U.S. Federal Census 1880 U.S. Federal Census, by Ancestry.com, NA Film Number T9-0205 Page Number 405A. [S245] U.S. Federal Census 1900 U.S. Federal Census, by Ancestry.com, ED40. Dwelling 316. [S244] U.S. Federal Census 1910 U.S. Federal Census, by Ancestry.com, ED109. Dwelling 138. [S243] U.S. Federal Census 1920 U.S. Federal Census, by Ancestry.com, ED108. Dwelling 43. [S250] U.S. Federal Census 1930 U.S. Federal Census, by Ancestry.com, ED53. Dwelling 100. Name Variation Martha Floy Stanley was also known as Floy Martha. Married Name 28 February 1909 As of 28 February 1909,her married name was Hill. Martha Floy Stanley was born on 8 February 1889 at Harlan, Iowa. She was the daughter of John Leonard Stanley and Lucinda Jane Hodgen. Martha Floy Stanley married Guy Bertram Hill, son of John B. Hill and Rosetta Mercer, on 28 February 1909 at Ft. Pierre, South Dakota. Martha Floy Stanley died on 22 November 1971 at Seymour, Outagamie, Wisconsin, at age 82. Paul Bertrum Hill was born circa 1911 at South Dakota. He was the son of Guy Bertram Hill and Martha Floy Stanley. Dean Robert Hill was born circa 1913 at South Dakota. Irene Adah Hill was born circa 1918 at Minnesota. She was the daughter of Guy Bertram Hill and Martha Floy Stanley. Helen Lucille Hill was born circa 1920 at Wisconsin. James Theodore Hill was born on 8 August 1925 at Brown, Wisconsin. James Theodore Hill died on 1 July 1950 at Brown, Wisconsin, at age 24. Name Variation Julia F. Jackson was also known as Julietta. Name Variation Julia F. Jackson was also known as Juliette. Married Name 26 June 1881 As of 26 June 1881,her married name was Trimble. Julia F. Jackson was born on 3 January 1843 at Pope, Illinois, also reported as Indiana. She was the daughter of Albion Jackson Jr and Jane Mercer. Julia F. Jackson married Christopher Columbus Trimble, son of Captain John Trimble and Susan Jane Nuckols, on 26 June 1881 at Windfall, Tipton, Indiana. Julia F. Jackson died on 15 April 1909 at home, Windfall, Tipton, Indiana, at age 66 Mrs Columbus Trimble (Julia Jackson) obituary. She was buried after 15 April 1909 at Brookside Cemetery, Windfall, Tipton, Indiana, Article of travelers to funeral of Mrs C C Trimble (Julia Jackson). Albion Jackson Jr witnessed the migration in 1848 at Vevay, Indiana. Julia F. Jackson had 4 with 3 living in 1900 children. [S248] U.S. Federal Census 1860 U.S. Federal Census, by Ancestry.com, Dwelling 1278. Page 181. [S246] U.S. Federal Census 1880 U.S. Federal Census, by Ancestry.com, ED132. Dwelling 216. [S245] U.S. Federal Census 1900 U.S. Federal Census, by Ancestry.com, ED119. Dwelling 82. Martha Jackson was born before 1846. Albion Jackson Jr witnessed the migration in 1848 at Vevay, Indiana. Name Variation Christopher Columbus Trimble was also known as Columbus. Name Variation Christopher Columbus Trimble was also known as C. C.
Christopher Columbus Trimble was born on 27 February 1828 at Grayson, Virginia. He was the son of Captain John Trimble and Susan Jane Nuckols. Christopher Columbus Trimble married Lydia McCormick on 4 August 1850 at Sardin, Decatur, Indiana, also reported as 14 Apr 1850. Christopher Columbus Trimble married Julia F. Jackson, daughter of Albion Jackson Jr and Jane Mercer, on 26 June 1881 at Windfall, Tipton, Indiana. Charles M Trimble 1886 - 1944. He was buried after 23 December 1913 at Brookside Cemetery, Windfall, Tipton, Indiana. In February 1913 at Tipton, Indiana, C C Trimble 85th birthday celebration. [S244] U.S. Federal Census 1910 U.S. Federal Census, by Ancestry.com, Year: 1910; Census Place: Cicero, Tipton, Indiana; Roll: T624_382; Page: 4A; Enumeration District: 182; Image: 502. Charles Mercer Trimble was born on 16 July 1886 at Indiana. He was the son of Christopher Columbus Trimble and Julia F. Jackson. Charles Mercer Trimble married Oda Margaret Barrows, daughter of Jacob Barrows and Margaret E. Henry, in 1909. Charles Mercer Trimble died on 11 September 1944 at Windfall, Tipton, Indiana, at age 58 Charles Mercer Trimble obituary. [S243] U.S. Federal Census 1920 U.S. Federal Census, by Ancestry.com, Year: 1920;Census Place: Richmond Ward 4, Wayne, Indiana; Roll: T625_474; Page: 2A; Enumeration District: 170; Image: 568. [S250] U.S. Federal Census 1930 U.S. Federal Census, by Ancestry.com, Year: 1930; Census Place: Richmond, Wayne, Indiana; Roll: 637; Page: 8A; Enumeration District: 38; Image: 993.0. [S373] U.S. Federal Census 1940 U.S. Federal Census, by Ancestry.com, Year: 1940; Census Place: Richmond, Wayne, Indiana; Roll: T627_1109; Page: 3B; Enumeration District: 89-38. Name Variation Martha Louise Trimble was also known as Martha D.
Name Variation Martha Louise Trimble was also known as Mattie L.
Married Name 6 August 1904 As of 6 August 1904,her married name was Allen. Martha Louise Trimble was born on 18 July 1883 at Indiana. She was the daughter of Christopher Columbus Trimble and Julia F. Jackson. Martha Louise Trimble married Fred James Allen on 6 August 1904 at Richmond, Wayne, Indiana. 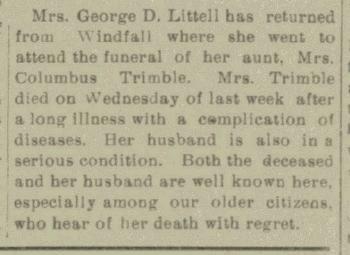 Martha Louise Trimble witnessed the burial of Julia F. Jackson after 15 April 1909 at Brookside Cemetery, Windfall, Tipton, Indiana; Article of travelers to funeral of Mrs C C Trimble (Julia Jackson). Martha Louise Trimble died in April 1973 at age 89. Martha Louise Trimble obtained US Social Security Card at Indiana; last residence Richmond, Wayne, Indiana. She had zero children. [S244] U.S. Federal Census 1910 U.S. Federal Census, by Ancestry.com, Year: 1910; Census Place: Richmond Ward 7, Wayne, Indiana; Roll: T624_388; Page: 11A; Enumeration District: 0201; FHL microfilm: 1374401. Name Variation Kenneth Blain Trimble was also known as Kenneth Blaine. 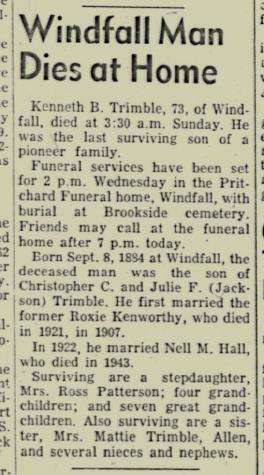 Name Variation Kenneth Blain Trimble was also known as K. B.
Kenneth Blain Trimble was born on 8 September 1884 at Windfall, Tipton, Indiana. Kenneth Blain Trimble married Roxy June Kenworthy in 1907. Kenneth Blain Trimble married Nellie M. Hall in 1922. 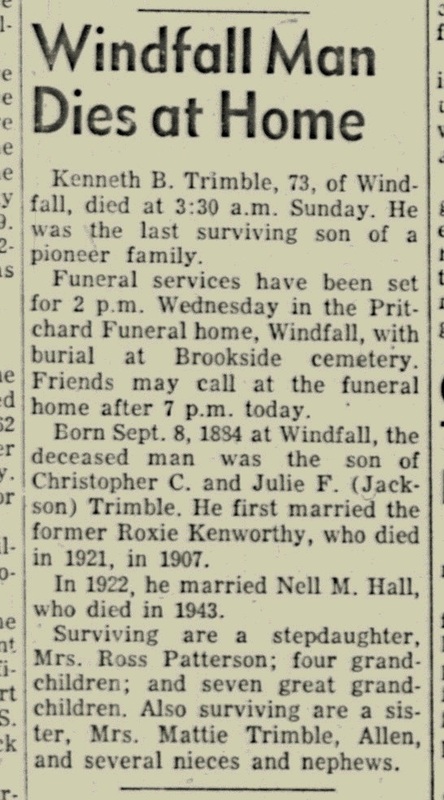 Kenneth Blain Trimble died in February 1958 at Tipton, Indiana, at age 73 Kenneth Trimble obituary. In 1942 at World War II Draft Registration, Tipton, Indiana. [S243] U.S. Federal Census 1920 U.S. Federal Census, by Ancestry.com, Year: 1920;Census Place: Wildcat, Tipton, Indiana; Roll: T625_466; Page: 13B; Enumeration District: 206; Image: 560. [S250] U.S. Federal Census 1930 U.S. Federal Census, by Ancestry.com, Year: 1930; Census Place: Wildcat, Tipton, Indiana; Roll: 631; Page: 6A; Enumeration District: 15; Image: 316.0. Fred James Allen was born in 1880 at Illinois. He married Martha Louise Trimble, daughter of Christopher Columbus Trimble and Julia F. Jackson, on 6 August 1904 at Richmond, Wayne, Indiana. of Locomotive Firemen and Engineers. Survivors include the widow; two brothers, Harry Allen, of Louisville, Ky., and Harlan Allen, of Detroit, Mich; and a number of nieces and nephews. Name Variation Oda Margaret Barrows was also known as Odo. Name Variation Oda Margaret Barrows was also known as Barrow. Name Variation Oda Margaret Barrows was also known as Margaret Oda. Married Name 1909 As of 1909,her married name was Trimble. Oda Margaret Barrows was born in February 1885 at Indiana. She was the daughter of Jacob Barrows and Margaret E. Henry. Oda Margaret Barrows married Charles Mercer Trimble, son of Christopher Columbus Trimble and Julia F. Jackson, in 1909. Oda Margaret Barrows died in 1975. [S245] U.S. Federal Census 1900 U.S. Federal Census, by Ancestry.com, ED132. Dwelling 6. [S244] U.S. Federal Census 1910 U.S. Federal Census, by Ancestry.com, Year: 1910; Census Place: Windfall Ward 2, Tipton, Indiana; Roll: T624_382; Page: 5B; Enumeration District: 195; Image: 836. Name Variation Julia Margaret Trimble was also known as Judy. Married Name before 1938 As of before 1938,her married name was Mendenhall. Julia Margaret Trimble was born on 23 September 1912 at Indiana. She was the daughter of Charles Mercer Trimble and Oda Margaret Barrows. Julia Margaret Trimble married Paul H. Mendenhall before 1938. Julia Margaret Trimble died on 27 August 2002 at age 89. [S373] U.S. Federal Census 1940 U.S. Federal Census, by Ancestry.com, Year: 1940; Census Place: Muncie, Delaware, Indiana; Roll: T627_1038; Page: 5B; Enumeration District: 18-28A. Captain John Trimble married Susan Jane Nuckols. Captain John Trimble was born on 2 February 1779. He died in 1865 at Virginia age 93. Name Variation Susan Jane Nuckols was also known as Nuckolls. Susan Jane Nuckols married Captain John Trimble. Susan Jane Nuckols was born in 1788. She died before 1830 at Virginia. Married Name 4 August 1850 As of 4 August 1850,her married name was Trimble. Lydia McCormick married Christopher Columbus Trimble, son of Captain John Trimble and Susan Jane Nuckols, on 4 August 1850 at Sardin, Decatur, Indiana, also reported as 14 Apr 1850. Lydia McCormick died after February 1870. John Charles Trimble was born on 18 July 1851. He was the son of Christopher Columbus Trimble and Lydia McCormick. John Charles Trimble died on 16 August 1852 at age 1.